In the early 13th century, a wealthy merchant’s son knelt before a crucifix in a small, crumbling chapel near Assisi, a village in Italy, and received a message from the Lord: “Go, Francis, and repair my house, which as you see is falling into ruin.” Taking the message literally, Francis began gathering stones to fix up the dilapidated structure and two others nearby. Some time later, while praying in one of those smaller chapels—Our Lady of the Angels, or the Porziuncola (meaning “little portion”)—he received a further revelation: that only the poor were true Christians. Francis gave away his remaining possessions and began preaching the sanctity of humility, poverty, and peace. Legend has it that a few years later, on August 2, 1216, he received a special indulgence from Pope Honorius III: unconditional absolution for anyone who visited the Porziuncola on that date in the future. The expedition moved on, but a decade later, the Spanish established a town nearby, just downriver from an indigenous village called Yangna. With a supply of fresh water rare in such dry country, the town prospered, and after it became part of an independent Mexico in the 1820s and then part of the United States in the 1840s, Los Angeles boomed. With this success, however, the river came under severe strain. What had made Los Angeles the fertile paradise depicted in promotional brochures distributed widely in the East now suffered as the city’s population soared, from roughly 11,000 in 1880 to nearly 320,000 in 1910. Recognizing that it would need another source of water, William Mulholland, head of the city’s Department of Water and Power, devised a plan to build a 233-mile aqueduct from the Sierra Nevada to the San Fernando Valley, just north of LA’s existing boundaries (events that were later fictionalized in the 1974 film Chinatown). Titanic Project to Give City a River, declared the front page of the Los Angeles Times, as if it didn’t already have one. Weeks later, a rival revealed that the paper’s publisher, Harrison Gray Otis, and his son-in-law and successor, Harry Chandler, had formed a secret cabal that bought up land along the route and then flipped it to the city for a profit. Though the river was no longer much help to the city, it could still inflict great harm. Because of the region’s dry conditions, the river never carved a well-defined channel to the sea; instead, it meandered erratically across the vast floodplain now covered by the modern metropolis. That dangerous unpredictability made the Los Angeles Basin particularly prone to sudden, violent floods. An especially catastrophic one in 1938 sealed the river’s fate: At the city’s invitation, the Army Corps of Engineers replaced its banks and most of its bottom with 3.5 million barrels of cement. The river that had given birth to the city was now a “water freeway,” a corps official boasted—a means of moving fresh rainfall into the ocean as quickly as possible. 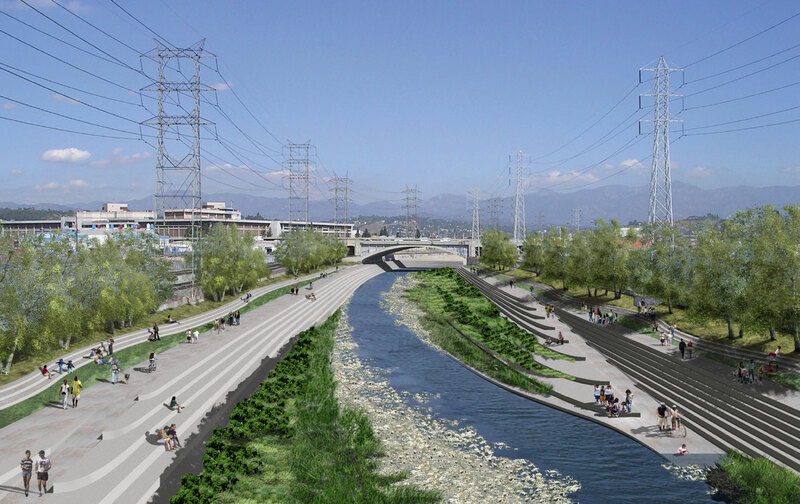 The Los Angeles River is about to be reborn. Winding 51 miles from the San Fernando Valley past downtown and through South-Central cities like Vernon and Compton, the long-ignored watercourse has become the focus of an explosion of civic imagineering. In 2007, after years of lobbying by a diverse coalition of artists, planners, environmentalists, and social-justice activists, the city approved a master plan that reconceived the abandoned channel as “an urban treasure.” Covering only the 32 miles that pass through the city, the plan envisioned a river that at once provides “flood protection and opportunities for recreational and environmental enhancement, improves the aesthetics of the region, enriches the quality of life for residents, and helps sustain the economy of the region.” Bike lanes and terraced banks were to replace the post-apocalyptic hellscape featured in films like Repo Man and Terminator 2. Now, almost a decade later, the Army Corps of Engineers is in the final stages of approving a variation on those original themes: a $1.3 billion plan to restore an 11-mile stretch of the river just north of downtown. Pending congressional appropriations—the city and the federal government will split the cost—the corps will start to remove the concrete that it laid down 75 years ago. The job should be finished some 20 years after that. But as ambitious as that plan sounds at a time when large-scale, federally funded public-works projects are about as common as the now-extinct California grizzly bears that used to frequent the river’s banks, those 11 miles are only the beginning of what promises to be one of the most dynamic urban transformations of the 21st century. Thanks to new and resurgent urban trends like “densification” and “adaptive reuse,” the Los Angeles River is poised to become a new, unifying center for this famously uncentered region, and an exemplar of “best practices” for both ecological restoration and urban regeneration. For the city’s young Democratic mayor, Eric Garcetti, a longtime advocate of river redevelopment, it’s a legacy initiative, and the foundation for a likely future bid for national office. And that’s precisely the fear of many current residents: that because real-estate interests have been free to speculate and exert influence without adequate public oversight, the very people who fought for open spaces in their neighborhoods along the river—among the least wealthy and least healthy in LA, and with the fewest public parks—may not be able to afford to stick around long enough to enjoy them. In the Chinatown offices of the Southeast Asian Community Alliance (SEACA)—just above a trendy Thai restaurant that was about to be opened—I met a local activist named Daniel Paredes, a Frogtown resident who was studying urban planning at the University of California, Berkeley, a few years ago when he learned that his family had been illegally evicted from their apartment. Eventually, he said, the building’s four low-income Latino families were replaced by middle-class whites. Paredes, now a labor organizer, helpfully walked me through the sordid land-use history of downtown LA. Early in the 20th century, Chinatown itself was moved about a mile north to make way for Union Station; in the early 1950s, the city, promising to build affordable housing, forcibly removed Latino landowners from nearby Chavez Ravine, only to give the land to the newly arrived Dodgers for a baseball stadium; later, Bunker Hill, a neighborhood of Victorian homes and diverse populations, was razed to make way for a district of (still partially vacant) skyscrapers and the Frank Gehry–designed Walt Disney Concert Hall. Many current residents of Chinatown, Frogtown, and other river neighborhoods, Paredes said, are the same people previously displaced from these other areas, or their descendants. SEACA’s executive director, Sissy Trinh, has been pushing public officials to consider ways to prevent the river revitalization from causing the kind of widespread displacement that has accompanied such projects elsewhere. Citing projections that redevelopment could bring more than $5 billion in investment and create as many as 18,000 jobs, Trinh told me that the city should focus on ensuring that the money is prioritized for affordable housing, workforce development, and protecting families and small businesses from displacement. One promising idea is the creation of an “Enhanced Infrastructure Financing District,” which would direct the increased tax revenues from booming neighborhoods into infrastructure upgrades and other local projects that might help current residents stay in their homes. 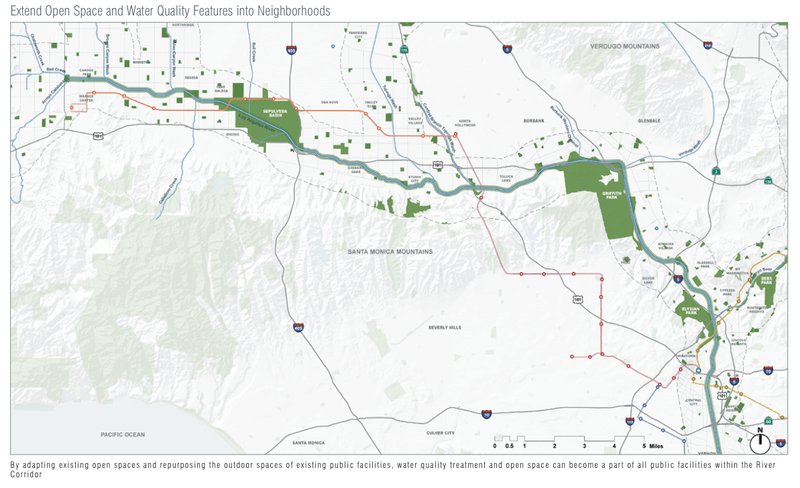 A map from the 2007 Los Angeles River Revitalization Plan proposed a “continuous River Greenway” through the city. Even so, MacAdams’s idea gained momentum, and the cause was soon adopted not just by his fellow environmentalists but by activists concerned with the unjust distribution of open space across the city. A unifying moment came in the late 1990s, when one of the largest developers in LA announced plans to build a large warehouse complex at the Cornfield, a heavily polluted former industrial site near the river. Both river advocates and neighborhood activists had long assumed that the land would eventually be cleaned up and included in a larger network of badly needed open spaces along the river. After hearing of the company’s plans, a group of environmental and social-justice activists united to fight the development on the grounds that it violated the civil rights of the area’s predominantly poor and Latino residents. They ultimately convinced the state to purchase the parcel, which will finally open as the Los Angeles State Historic Park later this year. Woods said he likes to call the Cornfield “the front porch of Los Angeles.” The question now is: Who gets to live in the newly renovated house? Last summer, shortly after an Army Corps of Engineers panel gave its preliminary approval to the city’s 11-mile restoration plan, the Los Angeles Times reported that for almost a year, the renowned architect Frank Gehry had been secretly working for the Los Angeles River Revitalization Corporation, the nonprofit created to spur development along the river, preparing what Mayor Garcetti proudly called “a master plan, in the truest sense of the word,” for the river’s entire 51-mile run. Walking me through their work at the Gehry Partners office in Marina del Rey, the company’s designated river architects, Anand Devarajan and Tensho Takemori, played down their role, explaining that they had spent almost a year merely “getting up to speed,” studying “what the opportunities are” and “what an identity for the river might be,” with a focus on water reclamation and flood control. But the firm’s ambitions are obviously larger. “If the mayor sticks with us, he’s going to make it a beautiful thing,” Gehry told a journalist late last year. Several people I met with spoke about the striking alignments of interest among the mayor, the River Corp., and the city’s power elite with regard to the project. Consider the activities of Morton La Kretz, the wealthy developer who pledged nearly $5 million for what the River Corp. calls on its website “the first philanthropically-funded bridge in Los Angeles,” a pedestrian/equestrian span from Atwater to Griffith Park. When it became clear that another $4 million would be needed to complete the bridge, the city, county, and state agreed to fund the rest. 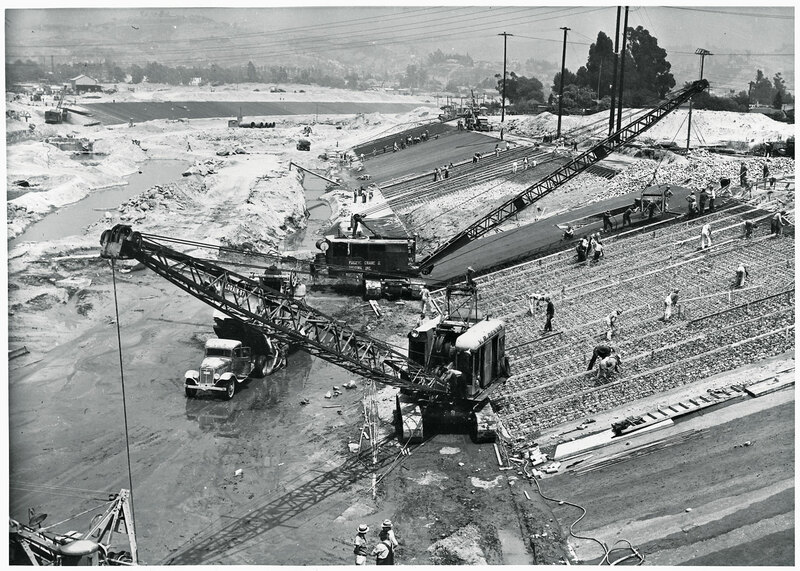 At the time, Garcetti praised La Kretz Crossing as “the kind of public-private partnership we need to continue bringing new life to the river and the neighborhoods around it.” Only later was it revealed that the La Kretz family owns land along the river near the bridge, which they hoped to have rezoned and developed into a 60-unit subdivision. At a café in the Arts District, a newly hip river neighborhood, I met with MacAdams and the celebrated landscape architect Mia Lehrer, a member of the Friends of the Los Angeles River board, whose firm was largely responsible for the 2007 revitalization plan now put in jeopardy by Gehry’s work. Lehrer told me that she’d been the person who introduced La Kretz to the River Corp., but that she hadn’t known he owned property along the river. the LA River Corp., describes himself on LinkedIn as an “entrepreneur” who wants to “push the envelope of combining causes and capital.” A former chairman of the Liberty Hill Foundation, an influential progressive nonprofit in LA, Brownson studied urban planning at Harvard, where he was part of a team that won a prestigious national award for designing a plan—“City Beautiful + City Real”—for Washington, DC. It proposed a “‘fulcrum’ around which a transit-oriented mixed-use neighborhood can develop, serving as a live-work community of a ‘creative class’ of residents.” More than a decade later and 3,000 miles to the west, Brownson is well-positioned to implement those plans. The River Corp. was “created to be an entrepreneurial organization that can work across the public, private, and philanthropic sectors,” Brownson told me in the group’s office. Nominally independent from the city, the nonprofit represents what Brownson sees as a “new generation of leadership” in LA, dedicated to the shared “recognition that government alone can’t do the work” to redevelop the river. Its donors include banks, aerospace companies, and utilities, as well as philanthropic foundations and Los Angeles County. Its board, led by a former corps official, boasts several real-estate developers, lawyers, executives at film studios with lots abutting the river (including Warner Bros.’ Dee Dee Myers, a former White House press secretary under Bill Clinton), and Harry B. Chandler, great-grandson of the notorious Los Angeles Times publisher. 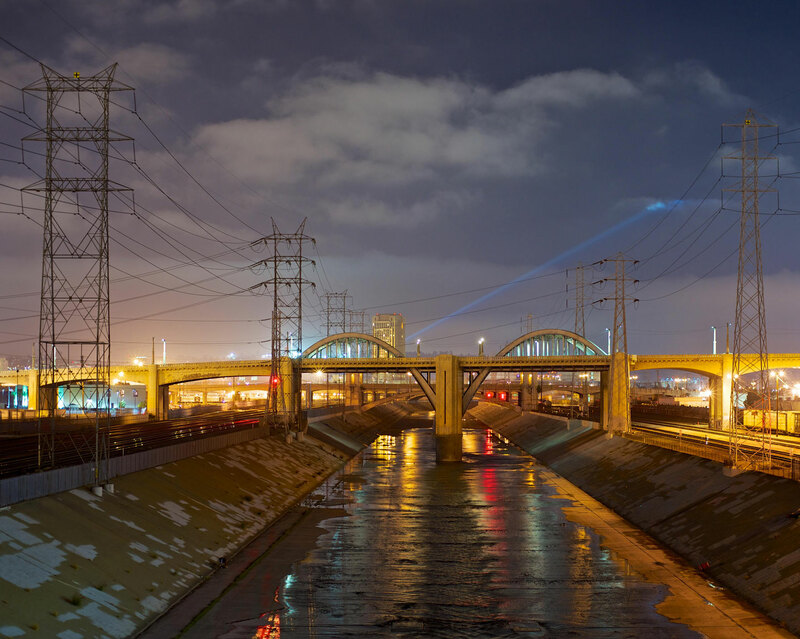 The LA River’s sad remains flow through downtown Los Angeles. These are the people who knew almost a year before the public that one of the most famous architects in the world was working on a “master plan” for the LA River. When I asked Brownson whether he was concerned about potential conflicts of interest on his board, the steward for key aspects of Garcetti’s legacy initiative seemed to take a deep dive into a dark and quiet internal sea. When he resurfaced, he spoke about the river as “an opportunity for LA to invest in itself,” “something we can leave to our children,” and “a space where we can discover our better selves.” When I asked the question again, Brownson said only that the River Corp. requires its board members to submit conflict-of-interest statements—to the board itself. Shortly after we spoke, the River Corp. hired 270 Strategies, a consulting firm founded by Obama-campaign veterans, to “give local communities a sense of ownership both in the planning and in the ongoing use of the project.” That “sense of ownership” is very different, of course, from ownership itself. The Citizens’ Committee sought out the “best brains in the United States” to produce a plan for the creation or preservation of open public space. They chose two leading firms for the job: Olmsted Brothers of Brookline, Massachusetts, led by the sons of Frederick Law Olmsted Sr., the designer of Central Park and the founder of American landscape architecture (and of The Nation), and Harland Bartholomew & Associates, city planners from St. Louis. But the Chamber of Commerce swiftly suppressed the plan it had solicited, with one member denouncing it as “a radical measure.” Business leaders didn’t want to raise taxes to pay for it, or take valuable real estate out of circulation, or allow the establishment of a regional parks authority, as had been suggested in the report—all of which would have diminished their power and profits. Instead, the city’s elite killed the Olmsted plan because it served their interests to do so. These days, their successors are reviving it for the very same reason. “LA is America—only worse,” Andrew Kopkind wrote in these pages after the Rodney King riots of 1992, quoting activist and Mother Jones cofounder Paul Jacobs. That’s true not only of the city’s social tensions, but also of its relationship to the natural environment. Smog-befouled Los Angeles, the Eden that paved over its garden, is a symbol of the patterns of development that have led to rising seas, intense droughts, and furious storms. The late-1930s decision to euthanize the river rather than revive it represents the more general choice that the United States took in the 20th century: growth over sustainability, industry over ecology. This explains the allure of the plan to restore the Los Angeles River: If you can green it there, you can green it anywhere. The lost future may yet be regained. The risk, however, is that attempts to correct the mistakes of the last century may only compound the defining problems of this one: the privatization of the public sphere, the worsening disparities of wealth and power between the many and the few. “If we do it right,” Gehry said at an event in September, “we can really make the High Line look like a little pishy thing.” Given that Manhattan’s elevated park, at merely 1/35th the length of the river, has helped transform the surrounding neighborhood into a playground for the rich, residents of LA’s river-adjacent communities are right to be concerned. In Laudato Si’: On Care for Our Common Home, his encyclical about climate change, Pope Francis writes about how “we find beautiful and carefully manicured green spaces in so-called ‘safer’ areas of cities, but not in the more hidden areas where the disposable of society live.” Haughty detachment from the poor often “exists side by side with ‘green’ rhetoric,” the encyclical notes. Eight hundred years ago, the pope’s predecessor offered absolution for pilgrims to St. Francis’s “little portion” of land outside Assisi. “We are faced not with two separate crises, one environmental and the other social, but rather with one complex crisis which is both social and environmental,” the saint’s namesake observes. Only if the plan to revive the Los Angeles River is truly designed to address that “complex crisis” will the city founded as El Pueblo de Nuestra Señora la Reina de los Ángeles del Río de Porciúncula finally earn its name as a place where ruins are repaired and sins redeemed.